Many new building projects must have a handicap ramp, or wheelchair ramp, that meets the minimum requirements of the Americans with Disabilities Act (ADA). These ramps provide safe access to users with wheelchairs or walkers and are also helpful for people with strollers. The primary ADA guidelines for ramps involve the ramp slope and length, landing size and placement, and handrail construction. In addition to ADA requirements, the local building code may impose additional or substitute requirements that must be followed in the given jurisdiction. As defined by the ADA, a ramp is a sloping route constructed with a slope greater than 1:20 (1 inch of vertical rise for every 20 inches of horizontal length, or run) and must conform to the standard ADA specifications for ramps. Ramps may have a maximum slope of 1:12. Ramps must be a minimum of 36 inches wide. Some areas require wider ramps. All edges must be protected to keep anyone from slipping off. All ramps shall have top and bottom landings as wide as the ramp itself and at least 60 inches long. Landing size must be at least 5 feet square. Ramps must have handrails on both sides if their rise is greater than 6 inches or their length is greater than 72 inches. Cross slopes (areas where a ramp slopes sideways, perpendicular to the ramp's length) must be less than 1:50, and surfaces must be slip-resistant and stable. A level landing is required at the bottom and top of the ramp. Maximum threshold height (at building entry) is 3/4 inch (19 mm) for exterior sliding doors and 1/2 inch (13 mm) for other types of doors without modification. The ramp must have handrails on both sides of all ramp segments. The inside handrail on switchbacks shall always be continuous. 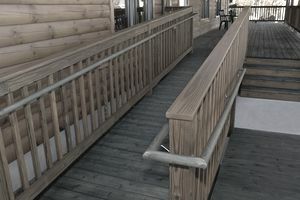 When a handrail is not continuous, handrails shall extend at least 12 inches beyond the top and bottom segment and must be parallel with the floor and/or ground surface. A clear space of 1 1/2 inches must be provided between the handrail and the wall where the handrail is installed. When the handrail is located in a recess, it must be at least 3 inches deep and shall extend at least 18 inches above the top of the rail. Surfaces of the handrail shall be continuous without interruption or obstructions. The top of the handrail surface shall be placed between 34 and 38 inches above the ramp's finished floor surface. The diameter of the gripping surface of the handrail shall be 1 1/4 to 1 1/2 inches, or the shape shall provide an equivalent surface. The handrail shall be free of any sharp or abrasive elements. Edges shall have a minimum radius of 1/8 inch. While the maximum slope allowed by ADA guidelines is 1:12, the ADA recommends a more gradual slope of 1:16 to 1:20, whenever possible. A 1:12 ratio is too steep for some people to navigate, and a lower slope may be required for some public buildings. Depending on the slope and the material used to build the ramp, the surface may need some extra anti-slip texture to help prevent slipping.